The borough of Jim Thorpe is one of the most scenic places in the state. It reminds me of Silverton, and Durango, CO. People have referred to it as "Little Switzerland," and their comparisons are certainly earned. The historic architecture and natural beauty of this place, and the entire Lehigh Gorge region, are truly awesome. The bulk of the major architecture dates back to Gilded Age opulence. The historic Central Railroad of New Jersey Station. The Lehigh Gorge Scenic Railroad launches from here, using Bethlehem Steel built coaches. This was once an area that was severely environmentally degraded, with an economy in shambles when the anthracite coal industry died. Now Jim Thorpe is home to many boutique shops, eateries, and historic tours. The stunning Carbon County Courthouse is both imposing and beautiful at the same time. It is the centerpiece of an incredible collection of buildings. Here is the historic Carbon County Prison, a place that played a major role in some of the greatest injustices to ever occur in the American judicial system. Twenty impoverished and exploited Irish-Catholic Immigrant coal miners were accused of being murderers on flimsy/non-existent evidence, and were executed. They had spoken up on the horrendous working conditions and were framed by the ruthless Pinkerton guards that would go on to complete other violent actions on the other side of the state during the massacre at the Homestead Strike. This Irish miners are now martyrs for the Labor Movement. Known as the Molly Maguires, they were held, and some were executed, at the Carbon County Jail, which is now a museum. The Old Jail Museum is fully restored and hosts tours. A handprint is said to be located on the wall of one of the cells from one of the executed Molly Maguires. The tops of the gorge provide tremendous views. Be sure to hike the Glen Onoko Falls Trail, the Switchback Railway trail, and others, to get fantastic views of the Lehigh Gorge. It quickly becomes evident how this area became a major railroad destination in the Victorian Era, said to once eclipse the amount of visitors of Niagara Falls. Lehigh Gorge and Jim Thorpe are spectacular places to check out. The history and natural beauty of this area is truly amazing. This is the gateway to the Poconos, with Hickory Run State Park being located nearby, and more. Today we explore the Allegheny Reservoir and Allegheny National Forest Recreation areas. These areas are beautiful. A hint of fall color makes the area even more beautiful. For more background on the area, and places to check out, including Bent Run Falls, and more, check out this article. The creation of the reservoir more than 50 years ago is something that took away large portions of land from the Native American Seneca Nation of Western NY. 10,000 acres of the most fertile land that was under Seneca Nation Control was taken, roughly a third of all of their land. The flooding of the land broke a treaty that dated back to the days of George Washington. The building of the dam even inspired a protest song by Johnny Cash and Pete Seeger. Johnny Cash and Pete Seeger: "As Long As the Grass Shall Grow"
One thing that is unmistakeable about the area is its incredible beauty. There are numerous overlooks throughout the gorge of the Allegheny River. This is Jakes Rocks, with a view overlooking the Kinzua Dam, Allegheny Reservoir, and river. The other side of the Jakes Rocks area gives a tremendous view of the Allegheny Reservoir. Each tributary to the reservoir in this area has an impressive gorge associated with it, and each of those locations have transformed into "bays" in the reservoir. Now to the Rimrock Overlook. There is a short walk to the overlook, no more than a tenth of a mile. You can also hike up to the overlook from the bottom of the gorge. A taste of the spectacular views! For those of you who are brave, a stairway takes you down to the bottom of the boulders, said to have been built by Chief Cornplanter himself. The Cornplanter Steps are pretty awesome, though there does not seem to be any definitive proof they were made by him. Some more boulders! This is certainly one of the largest, if not the largest, rock city overlook within the state. Rimrock is gorgeous. There were swarms of ladybugs throughout the reservoir area, more than I have ever seen. Allegheny National Forest/Allegheny Reservoir area is simply gorgeous. It is well worth checking out. Head up the shores of the reservoir and head into New York and into the Seneca Nation's Reservation. This area is beautiful, especially in the fall. Looking for an epic place to go in the fall, or any time of the year for that matter? Hickory Run State Park in the should be a destination for you. Located in the middle of the Poconos in Carbon County, the fall colors here radiate like fire. The woodlands throughout the more than 15,000 acres in this state park are gorgeous. The woodlands are complemented with lots of CCC era architecture, geological wonders like the Boulder Field, Lehigh Gorge, and more. We spent the weekend camping at this relaxing state park and had a great time. The camping area, especially the lower loops, are in the midst of an excellent stand of mature forest. For the little ones, there is a great playground. There are a number of playgrounds throughout the park. The campground is exceptional, one of the best in the system of PA State Parks. And for those of you who love to fish, there are a number of ponds, created through CCC, Great Depression Era projects that employed the young men of this nation in the midst of economic catastrophe. Each of these ponds and creeks are excellent fisheries, with trout being one of the main species. The spillway for this CCC era dam, showing through the woods. But hiking through it is even more beautiful, especially on the Fireline Trail, which heads up along the eastern edge of the park and overlooks the gorge of the Lehigh River and Lehigh Gorge State Park, a popular destination fishing, rafting, kayaking, sightseeing, bicycling, and more. I rate the Fireline trail somewhere between easy and moderate. I did lightly roll my ankle on the way down, but it was still relatively easy, though somewhat rocky, and with moderate elevation change. Some of the park's other awesome trails include the Shades of Death Trail, Hawk Falls, and others. In all, 44 miles of trails traverse the outdoor wonderland of Hickory Run State Park, with many other trails in nearby areas, including in Lehigh Gorge State Park, Glen Onoko Falls, and others. The start of the trail is relatively flat, shortly heading across an old park road. You gradually begin to ascend the Lehigh Gorge, which at this time of the year is illuminated with fall color. A typical scene along the trail. The rocks that make up the higher areas of the trail are really pretty. The top area is home to a spectacular view of Lehigh Gorge, and a picnic area for those of you who want to take in the scenery and have a picnic lunch. I could spend hours in this spot. The views are awesome, and seeing the rafters and kayakers plug through the rapids is relaxing and exciting. The Lehigh River up here has some spectacular bends and is really scenic. Now heading back down! I wish there was a way to capture the smell of the forest in a picture. There is nothing else quite like that smell. Beach Trail provides an easy walk from Sand Spring Lake to the campground. The trail stretches from the lower loops of the campground, passing by sites 17, 53, 152 and 158 below the amphitheater. From there it crosses PA 534, across the road bridge, and continues on the service road to the beach. This wide, grassy trail branches off of Fourth Run Trail and ends at the northern park boundary (white blazes). It is possible to walk the park boundary to get to Leonardsville or Stage trails, but this can be difficult due to thick vegetation and should only be attempted by experienced hikers. This thin trail winds through a forest dominated by chestnut oak, mountain laurel (blooms mid-late June), and rhododendron (blooms early-mid July). Blue Trail is a connection between Pine Hill and Sand Spring trails. Blueberry picking is excellent along this trail close to the junction of Pine Hill Trail. Blue Trail also offers one of the best areas in the park to view mountain laurel when in bloom, but can be especially wet after rain or snow melt. The trail runs between Boulder Field and PA 534. Parking is available off of PA 534 across from Hawk Falls, or at Boulder Field. The trailhead at Boulder Field is directly across the field from the parking lot (look for the big yellow blaze on a tree). A modest elevation change and the rocky nature of the trail near Boulder Field makes the 3.5 miles seem longer in distance. This trail runs through sections of hemlock, spruce and beech forests. Bears, owls, white-tailed deer, turkeys, snowshoe hares and ruffed grouse are sometimes encountered along the trail. Hikers should allow 4 to 5 hours for a roundtrip trek. Parking is available at the trailhead along the Sand Spring Day Use Area road. The trail ends at PA 534. Deer Trail is an old logging road and is fairly open. In the spring and fall, vernal and autumnal pools along the trail are filled with various frog, toad and salamander species. Deer Trail is also an excellent trail for bird watching and listening for owls. Parking is available in a small lot off of PA 534. Originally developed as an access road for firefighting equipment, this trail runs from PA 534 in the west, intersects Skyline and Gould trails, to an intersection with Hickory Run Trail. About 0.5 mile from the trailhead is a picturesque overlook of the Lehigh River and Lehigh Gorge State Park. This is one of the most beautiful spots in the park to watch a sunset. Fireline Trail is scenic, but sections of the trail are open, steep and rocky making for challenging hiking, especially in the heat of summer. Along this trail watch for songbirds including prairie warblers and eastern bluebirds, and hawks. The longest trail in the park passes through a wide variety of landscapes and habitats. Parking is available off of Boulder Field Road or by the park office. From the park office walk the road behind the chapel 0.3 mile to the trailhead. Ridge, Manor House, Stage, Bear and Stone trails intersect Fourth Run Trail. Fourth Run crosses the trail three times and is excellent fishing for native brook trout. The trail dives under the turnpike in a wide tunnel that is prone to flooding during heavy rain. Numerous blueberry and huckleberry bushes are along this trail. Parking is available off of the exit road from Boulder Field or in the overflow lot of the Organized Group Tenting Area (OGT). This trail follows the boundary fence line that used to surround the game preserve of General Harry S. Trexler, who owned most of the property (from 1922-1933) that became Hickory Run State Park. The trail passes through an open forest with mountain and sheep laurel. The first 1/3-mile of the trail starting at the OGT can be very soggy in the spring and after rains. Parking is available just west of the Youth Forestry Camp entrance on PA 534. The trail winds through deciduous woods and fields, crossing Goulds Run at the trail’s mid-point at an intersection with Skyline Trail. The southern portion of the trail ends at Fireline Trail. In the summer look and listen for indigo buntings, broad-winged hawks, field sparrows, and eastern bluebirds along the trail. Parking is available off of PA 534, just east of the turnpike overpass. The trail begins in rhododendron thickets and hugs the side of a hill down to Hawk Run. A large footbridge crosses the creek. The trail bears right at Mud Run, wanders through a tunnel of rhododendron and ends with a view of Hawk Falls, a natural 25-foot waterfall. This trail is also an access point for fishing in Mud Run, which is delayed-harvest and artificial lures only. Hawk Run got its name from the Hawk family that owned a farm on the property across from the parking lot. The trail was an old road from Mauch Chunk (Jim Thorpe) and sometimes remnants of wagon wheels, nails and horseshoes can be found along the banks of Hawk Run. Swimming is permitted only at the designated swimming area of Sand Spring Lake. Parking is available by the park office or along PA 534 near the trailhead. This trail starts along PA 534 on the sharp bend west of the park office. It descends into a field where the National Park Service built a picnic area and parking lot in the 1930s. Parts of the curbing can still be seen among the wildflowers. This is one of the best places in the park to see butterflies. After passing the field, on the left are foundations from the village of Hickory Run dating back to the early 1800s. A brick mill was established along the trail and sometimes these bricks, with Hickory Run printed on them, are exposed. (Please do not remove any of these bricks.) At the halfway mark of the trail a footbridge crosses Hickory Run to Sand Spring Trail on the other side of the creek. Hickory Run Trail does not cross the bridge, but narrows and follows the creek to end at Fireline Trail near the Lehigh River. Parking is available at Hickory Run Lake off of Boulder Field Road. The trailhead is about 100 yards up the road past the parking area. This short but very scenic trail runs around the back of Hickory Run Lake and connects to Stage Trail. Two streams must be crossed, but this is not a problem unless it has been raining heavily. Leonardsville Trail branches off the northern end of Stage Trail and ends at the park boundary (white blazes) with State Game Land 40. The trail resembles a tunnel through a remarkably dense stand of rhododendrons and at times can seem almost completely enclosed. A few small stream crossings are required. The trail is a good place to look for animal tracks because the surface is mostly dirt. During the 1800s this trail was the main road between the villages of Leonardsville and Saylorsville. Parking is available off of PA 534 at the Fireline Trail trailhead, or at the park office. Manor House Trail does not begin at the Manor House. When parking at the park office, follow the road behind the Chapel for approximately 0.3-mile to the Fourth Run Trailhead. Manor House Trail splits off of Fourth Run Trail and curves toward the park boundary (white blazes). The trail then follows the park boundary eventually leaving the boundary to meet PA 534 across from the Fireline Trail trailhead. Most of the trail is easy walking, but the ½ mile section closest to PA 534 is very rocky. Occasionally grouse, woodcocks, flying squirrels, deer and bear are seen in this area. Parking is available in the pavilion parking lot. The trailhead is near the pavilion. This short loop meanders through a variety of tree and plant species. Halfway around the loop, Deer Trail branches off. Self-guided interpretive brochures corresponding with the numbered posts along the trail are available at the trailhead or the park office. The trail begins at the end of an unpaved access road at the eastern edge of the park off of PA 534, about 0.25-mile past the Hawk Falls/Boulder Field Trail parking area, or it can also be accessed from Hawk Falls Trail. Orchard Trail is shaped like a spoon. Where the 0.5 mile “handle” of the spoon connects to Hawk Falls Trail the trail is steep and rocky. The loop section of the trail is a series of switchbacks down to Mud Run. This trail provides access to the Mud Run Natural Area and fishing in Mud Run, a delayed-harvest and artificial lures only stream. The trail is maintained by the Pocono Outdoor Club. Parking is available off of PA 534 at the trailhead, east of the campground. Most of the trail follows the park boundary and meanders through an oak/maple forest that is thick with mountain laurel. Blue Trail connects to Pine Hill Trail 1.6 miles from the trailhead. The latter portion of the trail descends toward the Lehigh River. The trail ends at the intersection of Sand Spring Trail. A short, steep, rocky section near the end of the trail is unsuitable for cross-country skiing. Parking is available along the one-way road between Saylorsville Dam and the park office. When parking at the park office follow the road behind the Chapel to the Fourth Run Trail trailhead. Ridge Trail is narrow and winds through the valley carved by Hickory Run. Near the fordway are remains of a double sawmill and flash dam built in the 1830s. The trail begins in the campground near sites 13 and 108 and soon crosses an unbridged stream. Blue Trail branches off 0.25 mile from the trailhead. Hikers can also access the trail downstream from the park office before the sewage treatment plant. Parking for this access point is at the park office or the parking lot several hundred yards west of the park office on PA 534. The lower part of the trail was built over the old railroad bed built that served the brick factory. A wooden water tower and waterlines seen along the trail are artifacts from the work of the Civilian Conservation Corps and Works Progress Administration during the mid 1930s and 40s that originally developed the park as a National Recreational Demonstration Area. Thick rhododendrons and large birch trees shadow large portions of the trail. Sand Spring Trail ends at the junction of Pine Hill Trail near the Lehigh River. Parking is available by the park office or along PA 534 by the nature center and amphitheater. Although it has a gruesome name (attributed to the thick forests and rough terrain experienced by the early settlers), this is probably the most picturesque trail in the park. This rocky trail follows Sand Spring Run and meanders through rhododendron thickets and unique rock formations. 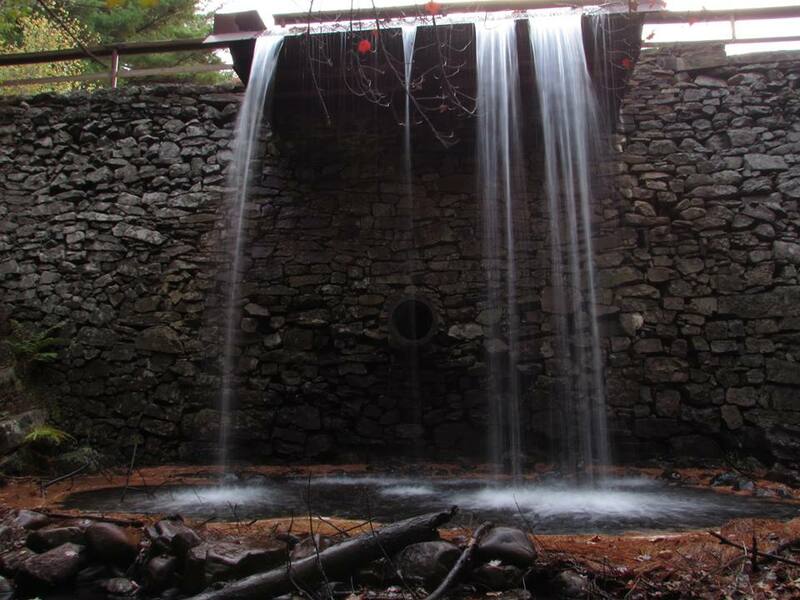 There are also remains of logging mills and dams dating back to the early 1800s. Trout fishing is popular at the three dams found along the trail. Shades of Death is a favorite among bird watchers and is an excellent place to spot Blackburnian and black-throated green warblers in the spring and summer. Narrow Skyline trail loops between Fireline and Gould trails. 0.3 mile from the Fireline Trail trailhead Skyline Trail branches off and meanders through a forest dominated by beech, gray birch and pitch pine. Skyline Trail loops through Gould Trail and heads on to cross Fireline Trail by the Lehigh River and continues on the edge of a steep slope that provides an excellent view of the Lehigh River, then merges with Fireline Trail. This wide trail bisects the park. Once the stagecoach road from Bethlehem to Wilkes-Barre, the trail is surprisingly flat and shows the skill of the early road builders. Starting in the northwest section of the park, Stage Trail begins at the park boundary (white blazes), runs near group cabin camps. Leonardsville Trail can be accessed from this portion of Stage Trail. The middle section of the trail runs between parts of Boulder Field Road. This lovely section runs across the top of a ridge cloaked in hemlock trees. Lake Trail can be accessed from this portion. The eastern section of the trail begins on the exit road from Boulder Field and descends to the park boundary to become Old Stage Road in the village of Albrightsville. Boulder Field Trail can be accessed from this portion. The east end of Stage Trail is called Bergers Field which is designated as a bluebird area. Please do not disturb the bluebird nest boxes placed around the field. Parking is available in the Boulder Field parking lot. This wide trail passes sheep laurel, hemlocks and deciduous forest to the park boundary line. Follow the park boundary to the west to an intersection with Fourth Run Trail. This trail connects Hickory Run Trail and Gould Trail. From Hickory Run Trail, the trail switchbacks up to the plateau, then meanders through a forest of beech, gray birch and pitch pine to an intersection with Gould Trail. We went to the awesome and famous Boulder Field on the second day, a National Natural Landmark. The cloudy, misty, and foggy weather on this day made the Boulder Field even more incredible to see. This geologic formation dates back to the end of the last ice age, with it being a short distance away from glaciers which formed the area. You can drive right out to the Boulder Field, or complete a hike to it. You will want to spend some time exploring it, just be cautious to avoid snakes. The cloudy weather really made the colors of the boulders, trees, and more, really pop out. Incredible to see. This 16.5 Acre location is covered in boulders, which are a remnant from the region's last glacial period, roughly 20,000 years ago. The freeze-thaw process broke nearby ridges into these boulders of red sandstone over thousands of years. The field is surrounded by trees that radiate color in the fall, making this an optimal time to see the field, though it is beautiful to see during any time of the year. The reddish sandstone of the field makes this Boulder Field distinct, compared to other boulder fields in Pennsylvania. This geological wonder is truly beautiful. At 400 feet wide, at its widest point, and roughly 1800 feet long, this enormous field of boulders is impressive. The boulders are said to be roughly twelve feet deep, and all within a 1 percent gradient of each other. Even though there seems to be an endless supply of boulders here, this field is threatened. No rocks are to be taken or moved, so that others may be able to enjoy this beauty in the future. People have vandalized stones, but thankfully other people have taken the initiative to prevent this and clean away damage. Even though these efforts are undertaken, mother nature will continue to weather away at these rocks, in the same way they were deposited here in the first place. These boulders continue to be weathered, using the freeze-thaw cycle, and other processes. Lichen and moss on the boulders on a shadier side of the field. Additionally, trees along the borders are slowly, but surely, reclaiming the Boulder Field. Many other locations that are home to a similar type of formation are all around us, though trees and vegetation have slowly reclaimed these lands back. Slowly, but surely, the borders of the Boulder Field have shrunken over the years as vegetation has creeped in, a beautiful process to see. When we visited this in the morning, we were greeted with nothing but the sounds of nature. We had the place to ourselves and it was quite breathtaking. There are numerous other awesome places to explore and check out, including Hawk Falls (Coordinates 41.0502° N, 75.6435° W ) a place we recommend checking out in the morning or evening. Sticking to some of the trails and areas in the daytime hours is a safer bet if you are looking to stay away from the crowds and just take in the peace of nature. It is amazing to see how many people come to Hickory Run to take in the tranquility of nature. It is something that we highly recommend doing. 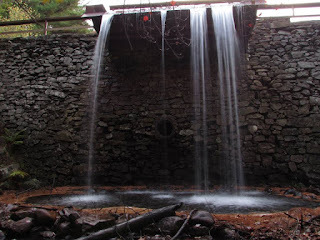 Spend at least a weekend exploring this, and other places in the area, including Lehigh Gorge State Park, the D&L Bicycle Trail, numerous other hiking trails, Lehigh River Rafting and Kayaking, fishing, the Glen Onoko Falls Trail, and some Gilded Age architecture in nearby boroughs, such as Weatherly, Jim Thorpe, and others, in addition to the majesty of the Poconos to the north and northeast of the area. 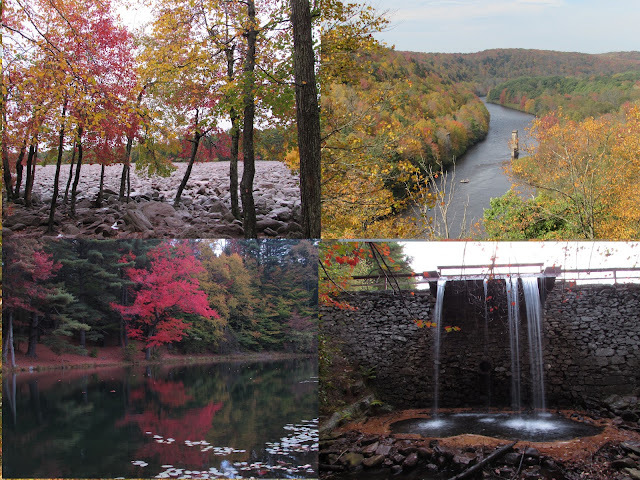 The Poconos are beautiful to check out during any time of the year, but especially during the fall. For more information, check out the park's website.